This will be my message to the Triad Women’s Forum tomorrow at the High Point Country Club in High Point, NC. Early adopters, key influencers and people who “get” all things social media tend to forget that social media is still very new for some and that not everyone wants or needs to be everywhere, simply because they can be. You can love twitter, and detest Facebook. Maybe you like FriendFeed or Plaxo. Maybe you’re still straddling the fence with leanings to one or another. That’s okay because the choices are yours to make! There was a woman in the audience at my last speaking engagement who was so freaked out at the sheer number of e-mails she was receiving from LinkedIn, she was at her wits end and ready to give it up. She went on and on about these e-mails and was visibly exasperated. That may seem extreme but when you don’t really understand how something works but everyone keeps telling you to participate and like it, it can be a little frustrating. Once I was able to convince her that she has control over what kind of information she receives, she was much more open to learning about the benefits of all of the tools. It can be a very satisfying experience. Do social media tools really matter? I had the pleasure of interviewing author John Cass today for a chapter of my upcoming book, 18 Rules of Community Engagement. 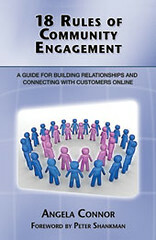 Cass is the author of the book, Strategies and Tools for Corporate Blogging and a great interview. A social media strategy is important, but if it doesn’t include how you will get people to care, it isn’t worth the paper it’s printed on. That’s my personal and professional opinion. Are we connecting on Facebook simply because we can? Social media has made some folks lose their minds. Particularly those who are addicted to Facebook. They are poking incessantly, tagging like their lives depend on it, and friending the very people they hated 20 years ago. When you don’t poke them back, they resort to super-poking, send you a plant of some sort and ask for your hand in a game of virtual scrabulous. Lovely. Something is missing here, and I think it’s common sense. So allow me to reintroduce the common sense factor to all of you avid Facebooker’s. If this doesn’t apply to you, reject it and move on. But if it does, hear me out. If we hardly spoke in 12th grade calculus class and often rolled our eyes at one another in the halls, why would we connect 20 years later to share all of the nuances of our lives? If you stole my boyfriend or played a cruel prank on me back in the day that caused me months of embarrassment, why would I care about your whereabouts today and what could you possibly have to say to me? For all you know, the person you’re reaching out to could have spent an inordinate amount of money on a therapist in an attempt to forget you, and here you are, super-poker in hand ready to rekindle that loving feeling. If I fired you, or you fired me and we engaged in a shouting match is a connection really something we should consider? No. And that’s okay, so move on to someone else. Don’t let Facebook allow you to forget history and open old wounds that should probably remain closed. If you’re that eager to find out what’s been going on with someone, lurk around and satisfy your need. Heck, Google them and get yourself a nice helping of their recent history. But if you know in your heart and your gut that a certain connection isn’t a good idea, don’t request it. Just because we have the tools doesn’t mean we have to use them. It’s great that we have the tools but we should also exercise good judgment and be selective with our actions. What are your thoughts on the use of Facebook? Know any die hard pokers? Tired of being tagged for the 25 random things about me post? Tell us about it. I am now in the all-important phase of gathering endorsements for the back cover. I’ve known this would come and I’ve been adding potential endorsers to my coveted spreadsheet for about a month now with the goal of asking pretty much all of them to take a sneak peek at my book and offer an endorsement. I’ve received two so far, and both made me feel all tingly and warm inside after reading them. These two paragraphs written by people whose work I admire and respect validate the hard work and late nights I’m putting into this project. It is just what I needed to keep forging ahead full steam. But let me tell you how I felt before opening the emails. My palms were a wee-bit sweaty. My feet even turned cold. I decided to leave my inbox before opening the first response, just to give myself a silent pep-talk in the event the person refused to endorse or told me they didn’t like it and could therefore not support me. After all, I am indicating in the introduction to the sneak peek that there is no pressure and I mean that. I am not interested in any false or sympathy endorsements so I have to be prepared for those who will be brutally honest. Book marketing, for the non-marketing type is no walk in the park. The good thing is, I’m getting the hang of it and I’m learning how to be pretty bold about it. That’s what it’s going to take to succeed, so I’m going to market this book until I’m blue in the face. And with all it entails, it just may come to that. My grandfather always said that anything that doesn’t kill you will make you stronger. Well, I’m not dead, so I must be getting stronger every day. 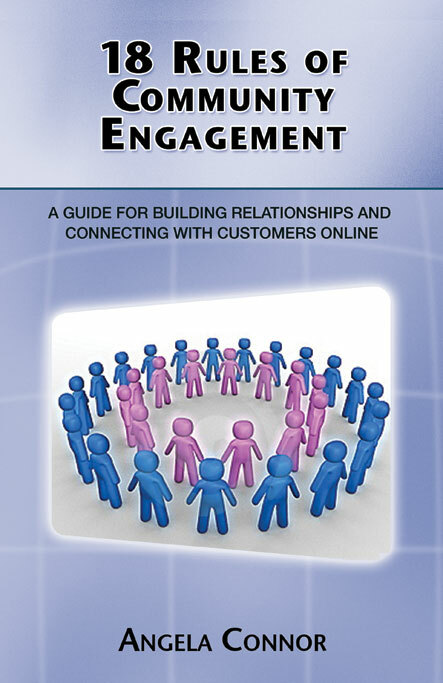 Oh, and BTW–if you’re interested in a sneak peek of my book 18 Rules of Community Engagement: Building relationships and connecting with customers online, let me know. See, I told you I was getting bold. And what’s a few more sweaty palms between friends? There will always be rock stars. I get that. We learn from them, sometimes hang on their every word and in most cases the attention and accolades are well-deserved. They may have been pioneers, early adopters or just smart people who do their thing and do it very well. Rock stars are important for every industry. Some of us want to be them when we grow up and aren’t afraid to admit it. We even contribute to their rock star status because we blog about them, quote them in major media and use their names in every other sentence in hopes that they will notice us. While being noticed may not be your individual goal, it is the goal of many. And why not? The true rock stars have the power to make us stars too, simply by association and riding their coattails is not a high price to pay to get that to happen. But that does not mean they know it all, or that their opinions are gospel, and the real rock stars will tell you as much. As social media (or any industry for that matter) evolves it’s important to be on the lookout for new voices. Seek out the people who are in the trenches doing interesting work and friend them. Ask them questions and then share the answers with your network. Give them an opportunity to write a guest blog. Sure, rock stars beget rock stars, but the average social media enthusiast plugging away with their blog, trying new marketing tactics, building and managing communities and testing new theories are good to know as well. They may not be interested in a high profile or perhaps don’t have the time to build one. Let’s bring them to light and pull as many people to the table as possible.We are not in a conference room where only 12 chairs will fit. This social media conference room is virtual. It’s huge and there are enough chairs for everyone. Keep up the #followfriday’s on twitter and find other ways to tell us about the people you know who we should know as well. I know I’m no rock star and I’m good with that, because I’m really not sure what that would really mean for me at the end of the day. I’m just happy to know and follow some smart people and continue to meet new ones. And if there’s someone you’d like me to know, tell me about them in the comments area. One of the things that warms my heart, is when I see members of the online community I manage, helping each other out in some meaningful way. We recently had a blogger mention that she and her son were going to be evicted from their apartment because she didn’t have the $350 needed to stay put. The community rallied behind her raising more than $600 dollars in two hours. Another member, who has been very verbal about her job loss and subsequent job search created a group called “The Unemployment Line” to offer support for members who have lost their jobs as well. They are supporting one another, offering interview tips and offering input on resumes. It’s really great to see all of this happening. But then I started thinking, what can I do? While it is certainly not a good idea for me, as the community manager to donate money I can do other things and on a larger scale. So I met with two local financial planners and asked them to participate in a live chat. I promoted it on the site for a week, indicating that there would be one hour of free financial advice available for anyone who wanted it, and called it: Managing Your Money During Hard Times. It was a success with about 40 unique visitors, but what’s been even more successful is the replay of the transcript. Those who missed it live are now coming back to read it and get the advice that was doled out to others. I am going to do more of this. Times are tough, and communities are coming together. If you manage a community, and you’re witnessing some of the poignant conversations taking place about job loss, and the state of the economy, find ways to help your members. And do come back and tell me about it. I think we shoud all learn from one another.